Nondairy milk and creamers can’t hang in the kitchen like the real deal—unless it’s coconut milk. 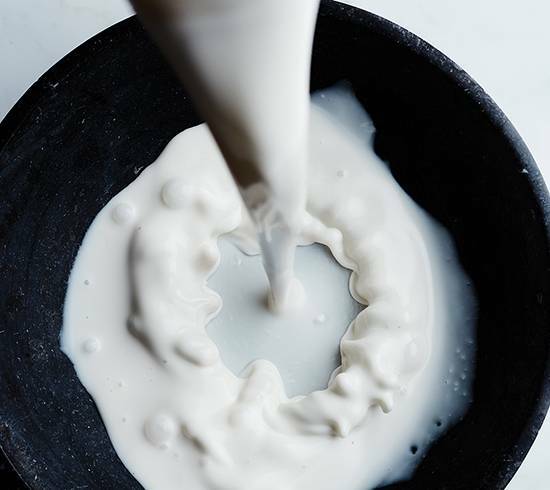 Unlike other plant-based milks, such as soy and almond, coconut milk thickens as it cooks down and has the consistency and mouthfeel closest to dairy thanks to its fat content. The fat allows it to bind with THC, which makes it a good partner for infusing. But we’re not talking about the coconut milk that has exploded on grocery store shelves in recent years. More often than not, coconut milk for cooking is the canned variety used in Thai and Indian recipes, consisting of coconut cream sometimes separated from the water. Just stir or gently warm it. You’ll find the largest selection of coconut milk at Asian grocers, including the brand Aroy-D, which has no thickeners, gums or preservatives. It’s most often an ingredient in savory dishes but it can be used for making sweets. Coconut cream can be infused, too, but it’s usually sweetened and meant for desserts. Because coconut milk figures prominently into Asian cuisine, recipes will often lean that way, too. Think curries and coconut-based sauces accented with fish sauce or soy sauce. But don’t allow tradition to limit its use. Infused coconut milk can add creaminess to dressings or any sauce that calls for cream or butter. Tap here for Infused Coconut Milk recipe.